The "Send CAN Frame" tool lets you directly send CAN frames. The top section of the window lets you send a single frame, the bottom section acts as a frame sequencer. You can enter packets in CBUS address format, e.g. "+1", "-2" or "+n4e1" ( decimal, without the quotation marks ). Once you've entered the packet, just click "send" or press Enter. You can enter the packet's data contents as hexadecimal numbers, for example "83 7C". Any spaces in the packets will be removed before sending. If you want to specify header contents, precede the packet data with the header in "( )" characters or "[ ]" characters for a standard or extended header, respectively. This tool works well in combination with the CBUS Console, where the actual frames generated and received can be viewed. If a message is unable to be created, a popup dialogue box will notify you. Remember, if sending out messages to a live MERG CBUS network, these will be received and acted upon accordingly! The bottom section lets you enter from one to four frames that will be repeatedly sent in sequence, with user-defined delays in between. Press the "Go" button to start the transmission sequence, and press it again to stop the sequence. You can alter the messages while it is running, those changes take effect the next time the frame is called in the sequence. The last frame to have been sent in the sequence is highlighted by a different background colour. You will be notified if the sequencer is unable to send a can frame. 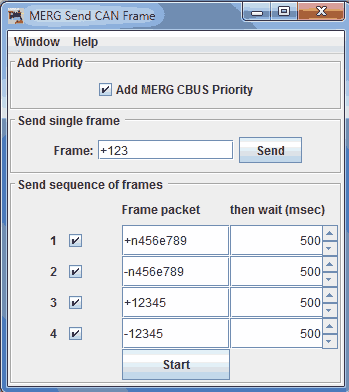 MERG CBUS priority - Adds a priority to the message header. Send as outgoing CanMessage - Sends as if message originating from JMRI ( selected by default ). You can view this help page within JMRI by selecting Help > Window Help in the top bar of the MERG Send CAN Frame window.